You can't keep a WOW girl down ... at least, not between the time her med wears off enough to think straight, and the pain gets bad enough that she has to take more. 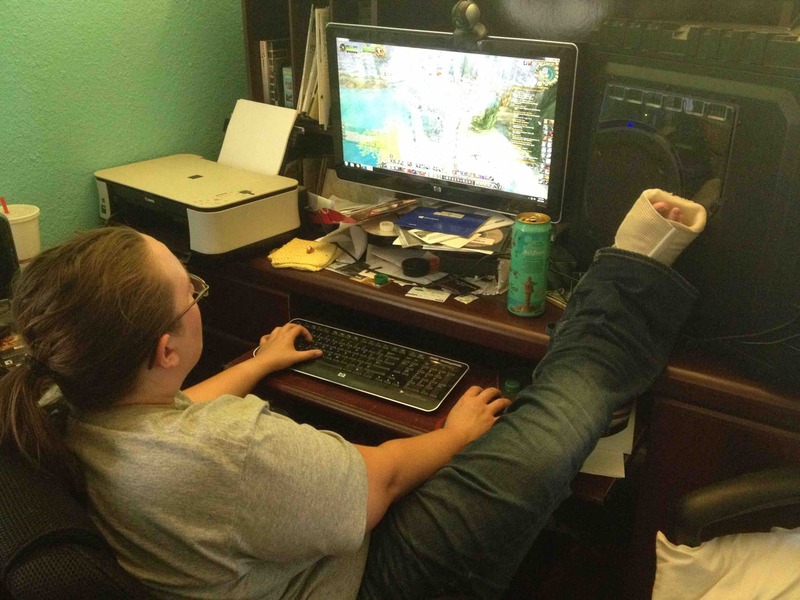 Sorry that her foot is broken but on the other hand, take it from a podiatrist, keeping that foot up is the best thing to do, it decreases swelling which decreases pain and increases healing. Yep, that's what the ER doc told us. Of course, there's only so much time you can hold that position before someone like Emily goes stir crazy. But there was no one to replace her at work yesterday, so that got her away from home for awhile--her boss and I made sure she kept it propped up when possible. She's in a "boot" now ... and it reminds me for all the world of a Cyberman leg.